This is one of those recipes that neatly achieves a little fanciness without requiring much in the way of special ingredients or prep time. 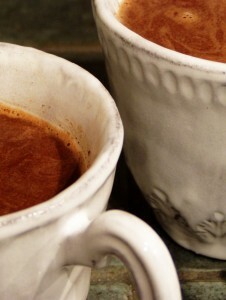 I can’t remember when I first tasted spicy hot chocolate, but I definitely fell in love. Smooth, earthy chocolate is punctuated beautifully by the power twins of cinnamon and cayenne. You can certainly exclude the Drambouie if you wish, but know that you are missing out (unless you are pregnant or otherwise medically excluded from alcoholic beverages, in which case hit the whipped cream with gusto and carry on with your spicy, chocolatey self). 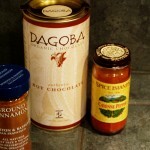 I recommend Dagoba Hot Chocolate here, though you can use any hot chocolate powder. Stop, go back, read that again. I’m taking you through a shortcut by using a hot chocolate powder, rather than unsweetened chocolate that you sugar up yourself. Do not try to make this with plain old Hershey’s, and definitely do not send me a nasty email after doing so wherein you tell me how yucky your drink turned out. Hot chocolate powders have sugar already blended in. I like Dagoba because it’s sweet, but not overly so. I’ve made hot chocolate from absolute scratch, and wasn’t happy enough with the results to be interested in the extra steps. Heat the milk in a small saucepan over medium heat, stirring occasionally with a whisk. 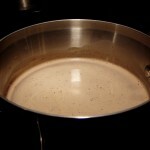 When vapors begin to rise, whisk in the chocolate powder until it is completely blended. Begin adding cinnamon and cayenne, just a few shakes of each to start, though you should use more cinnamon than cayenne. I recommend exercising a little restraint with the cayenne, as a little goes a long way. Not only will you quickly end up with hot chocolate that is too spicy to drink, but you will overpower the other flavors, rather than enhance them. Of course, if overpowering hotness is what you’re into, go for it - just don’t waste your nice chocolate on such a venture; use something pedestrian like Swiss Miss. Whisk the spices until fully combined. Once everything is well-blended, add the Drambuie and whisk one more time. Serve immediately, and top with whipped cream if desired. I typically do not serve hot chocolate of any kind with any other sweet food. Rather, I think of the hot chocolate as the main event. Every time I’ve been on a sugar bender and have grabbed a cookie or something to go with my fiery hot chocolate (against my better judgment), I end up feeling rotten from sweet overload. There’s a lot going on, palette-wise, in this recipe, so I hesitate to recommend any adjuncts here. If you absolutely must chew on something as you experience the layers of sweet, spicy flavor, stick with something very mild, like a ricotta cookie (coming soon). The Salty Spoon is powered by	WordPress 2.7 and delivered to you in 0.212 seconds using 24 queries.